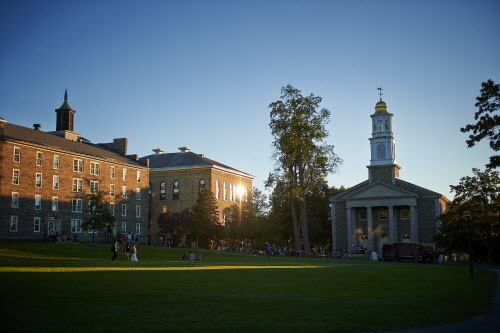 Colgate University is a private liberal arts institution providing excellent academics in rural Hamilton. The surrounding countryside of Central N.Y. is picturesque, and a bit isolated for some. Most do not view this as a drawback, rather as a magnet for the students and 3000 residents to mix and interact creating a tight knit community. Hamilton College is a short drive away, in the nearby town of Clinton. Stay: The Colgate Inn has been welcoming guests since 1925. Recently renovated, the rooms are spacious while still keeping the integrity of the hotel’s original character. Coffee: Saxby's believes in making life better “one cup at a time.” What a perfect way to start your day. Recently opened, a parent recommended we go to Fojo Beans. For an authentic taste of Colgate life, grab a cup at the Frank Dining Hall. Breakfast: It’s convenient—start the day at the Tavern at The Colgate Inn. You will most likely find a line of people waiting to get a bagel at Flour and Salt. Started by a Colgate graduate, F&S bakes EVERYTHING from scratch! Rye Berry is another good option serving a solid avocado toast. Casual: On every campus pizza reigns, and at Colgate, everyone loves Slices. Zagats ranks it as one of the top pizza places in the U.S.—pretty impressive for tiny Hamilton. Students rave about the wings at Rusch's. In the mood for Mexican - La Iguana makes all the sauces from scratch for their enchiladas, tacos, and burritos, topped with freshly made guacamole. If you are visiting Colgate in the winter months, grab a hot ramen bowl at N13 to warm up. A Step Up: The Colgate Inn has three restaurants for you to choose from. The Madison Room features a seasonal menu with daily specials. The more casual Tavern is the place for soups and salads while Rathskeller boasts over 20 craft beers. Seven Oaks Clubhouse is well worth the drive for their Parmesan Crusted Chicken. Local Attractions: If you are in Hamilton on a Saturday, stop by the farmer’s market on the Village Green. Head out for a morning run on the beautiful running trails behind campus. Have more time; consider extending your trip and exploring the beautiful Finger Lakes, here featured in Conde Nast Traveler. Just toured the Colgate University Campus? Are you a Colgate student, parent or Alumni? Fill out this 2 minute survey to supplement our Daytripper University Guide for Colgate University!